BACKGROUND AND PURPOSE: The petrous and cavernous segments of the extradural internal carotid artery take a complex course through the skull base before entering the subarachnoid space distal to the cavernous sinus. Despite the protection from trauma afforded by the anatomy, the petrous and carotid internal carotid artery (ICA) segments of the vessel remains subject to disease, the most important of which are aneurysms. Aneurysms affecting the petrous portion of the vessel are extremely uncommon, and presentation with otologic symptoms is unusual. These symptoms include hearing loss, tinnitus, and life threatening hemorrhage. This article emphasizes the need for a high level of suspicion for aneurysm as a potential cause for otologic symptoms. We report and discuss three cases of petrous carotid aneurysms with otologic manifestations to increase the awareness and aid in the diagnosis and treatment of this uncommon disorder. METHODS: The medical records and imaging studies of three patients presenting to our institution with aneurysms involving the petrous internal carotid artery were reviewed. One presented with progressive bilateral sensorineural hearing loss. The next patient presented with pulsatile tinnitus. The last patient presented to the emergency room unresponsive with severe epistaxis. 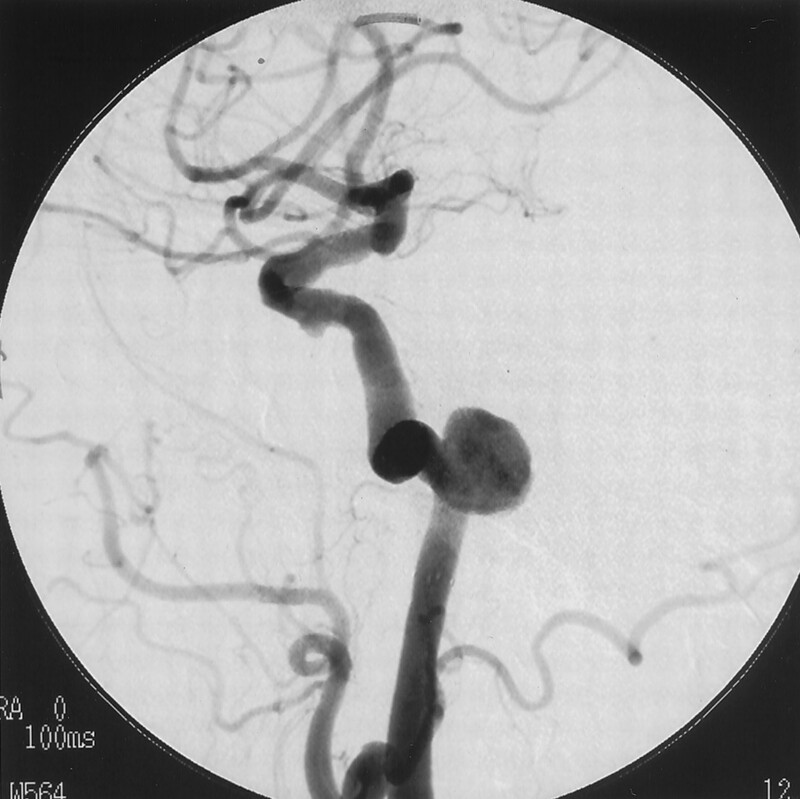 RESULTS: All three patients had imaging studies revealing petrous carotid aneurysms. Each patient had symptoms related to the aneurysms ranging from hearing loss, tinnitus, and life-threatening hemorrhage. CONCLUSION: Petrous carotid aneurysms are rare, and presentation with otologic symptoms is unusual. Awareness of these lesions as a cause of otologic symptoms, however, is highly important. These cases also illustrate the usefulness of endovascular treatments for aneurysms of the petrous portion of the internal carotid artery, which are extremely difficult to treat by using an open surgical approach. The petrous and cavernous segments of the extradural internal carotid artery take a complex course through the skull base before entering the subarachnoid space distal to the cavernous sinus. The petrous portion, the best-protected segment of the extradural internal carotid artery (ICA), is almost completely surrounded throughout its course by the bony walls of the carotid canal (1). Nevertheless, the cervicopetrous junction of the ICA is predisposed to injury from blunt trauma. This is because of the junction between the relatively mobile cervical ICA and the fixed carotid canal containing the carotid ICA. The arrangement permits stretching forces to be transmitted to the vessel wall by excessive head movement around the atlanto-occipital joint (2). Despite the protection from trauma afforded by the anatomy, the petrous and carotid ICA segments of the vessel remains subject to pathology, the most important of which are aneurysms. In general, aneurysms of the extradural carotid artery are far less common than those involving the intradural segments of the vessel. Although these aneurysms usually present as a result of mass effect, hemorrhage from extradural ICA aneurysms is nevertheless well described (3, 4). This is most often the result of traumatic aneurysms and usually arising from rupture of cavernous aneurysms medially into the sphenoid sinus with resultant epistaxis. As expected by the anatomy, aneurysms affecting the petrous portion of the vessel are extremely uncommon and presentation with otologic symptoms is unusual. We report four cases of petrous aneurysms in three patients, one patient the subject of a prior case report. These cases illustrate the spectrum of otologic symptoms with which petrous aneurysms may present. These symptoms include hearing loss, tinnitus, and life-threatening hemorrhage. An 85-year-old woman presented to the otolaryngology clinic at our institution for evaluation of progressive bilateral hearing loss. Although she had a 40-year history of bilateral hearing loss, audiograms documented a deterioration of hearing in the right ear within the past year. She denied tinnitus, vertigo, or recent ear infections. She denied any significant head injuries in the past. On examination, she had bilateral hearing loss and bitemporal hemianopsia. Audiogram evaluation showed severe to profound sensorineural hearing loss in the right ear with a mild, sloping to severe sensorineural loss on the left. A CT examination of her temporal bones was obtained, which revealed erosive lesions involving the petrous bone bilaterally, along the posteromedial wall of the horizontal carotid canals. Lucency was also seen extending from the petrous carotid canal to the cochlea with erosion of the basal and apical turns of the cochlea bilaterally (Fig 1). The vestibule, semicircular canals, vestibular aqueduct, and internal auditory canals were normal. MR imaging revealed questionable flow-related enhancement in these lesions. Case 1. 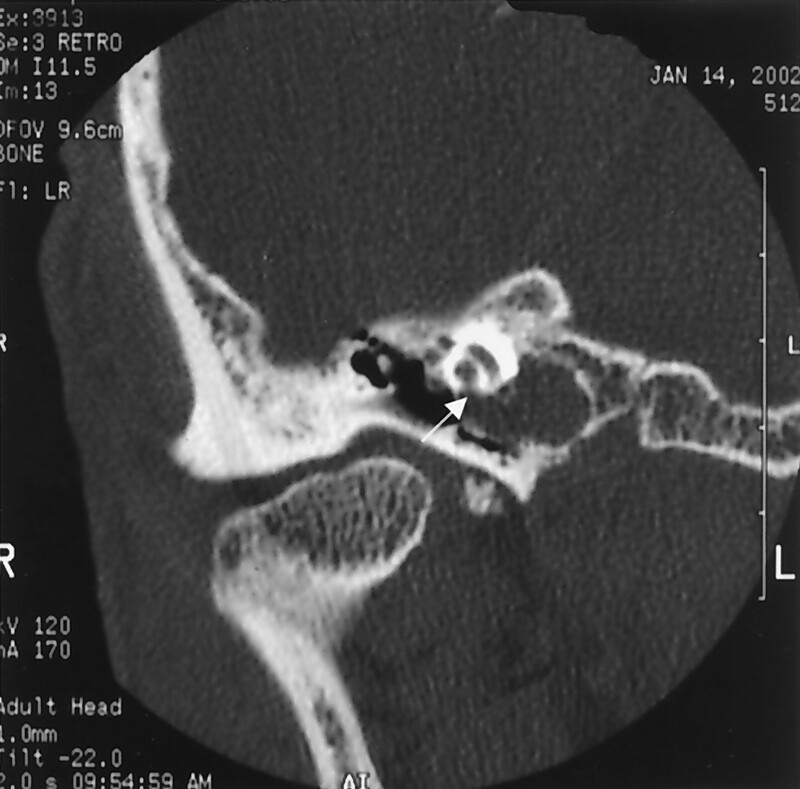 Coronal CT image through the right temporal bone demonstrates an erosive lesion involving the posterior wall of the right petrous carotid canal with erosion into the cochlea (arrow). A diagnostic cerebral angiogram was performed, which revealed bilateral 5–6-mm aneurysms in the petrous carotid arteries corresponding in location to the CT scan abnormalities (Fig 2). Subtle caliber changes were seen in the cervical ICAs bilaterally, which suggests that these findings represented sequela of remote dissections. Case 1. Image from a right common carotid artery injection demonstrates an aneurysm of the horizontal petrous ICA segment (arrow). Because of the patient’s age and the presence of bilateral ICA pseudoaneurysms, conservative management was chosen. A 54-year-old man presented to the emergency department at our institution unresponsive and markedly hypotensive with severe bleeding from his mouth and nose. Examination revealed hemorrhage from the opening of his right Eustachian tube, and packing of that area resulted in cessation of the hemorrhage following loss of nearly 10 U of blood. His past history was remarkable for sinusitis and ear infections involving the right ear for about a year. Treatment for this included placement of a myringotomy tube. At the time of his admission to the emergency department, the tube was found in the external auditory canal and the tympanic membrane was intact. 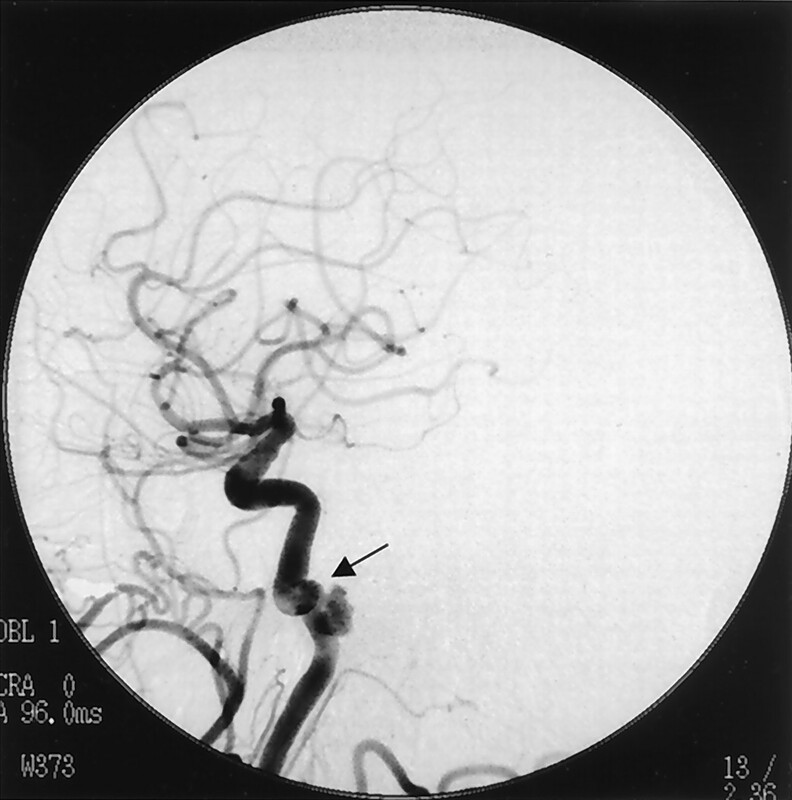 The patient underwent emergency angiography, which revealed a lobulated aneurysm 3 cm in maximal diameter involving the petrous portion of the right ICA (Fig 3). Injection of the left ICA demonstrated good cross-filling across the anterior communicating artery. Before treating the aneurysm, the patient had a CT scan to evaluate a potential etiology for the lesion. The CT scan revealed a rim of molded calcification of the petrous portion of the temporal bone and erosion of the aneurysm into the middle ear and into the middle fossa (Fig 4). The evidence for longstanding presence of the lesion made an infectious etiology unlikely and suggested the feasibility of stent placement of the aneurysm with preservation of the parent vessel. While on the CT scanner, the patient developed severe recurrent hemorrhage around the packing. He was immediately returned to the angiographic suite, where the right ICA was occluded using coils. No recurrence of the hemorrhage developed and excellent cross-filling was documented following the procedure. The patient remained comatose and MR imaging the next day documented abnormal signal intensity on T2 and diffusion-weighted images involving the thalami bilaterally consistent with prolonged anoxia. Case 2. Image from a right common carotid artery injection reveals a lobulated 3-cm aneurysm of the petrous segment of the ICA. Case 2. Unenhanced axial (A) and coronal (B) CT images demonstrate a large slightly hyperattenuated soft-tissue mass with smooth scalloped margins, measuring 3 cm in diameter expanding the petrous carotid canal with erosion of the medial wall of the middle ear (arrow). A 77-year-old woman was evaluated at our institution for left-sided pulsatile tinnitus. Imaging studies were performed as part of the patient’s workup. MR angiogram (MRA) showed a 1-cm left petrous ICA aneurysm and a CT of the temporal bone indicated erosion of the wall of the carotid canal with extension of soft tissue into the middle ear cavity. Cerebral angiography confirmed a wide-necked fusiform aneurysm 1.2 cm in maximal diameter arising from the anterior curve of the petrous segment of the carotid artery, projecting posteromedially with posterior extension into the middle ear cavity (Fig 5). Case 3. Image from a left common carotid artery injection demonstrates a 1.2-cm maximal-diameter wide-necked fusiform aneurysm arising from the anterior curve of the petrous segment of the ICA, projecting posteromedially. A Neuroform stent was placed across the entire aneurysm, which resulted in some slowing of flow within the lesion. A microcatheter was placed across the interstices of the stent into the aneurysm lumen and multiple detachable coils placed within the aneurysm. Following the procedure, the patient noted a significant decrease in her symptoms. These cases document three patients with aneurysms involving the petrous ICA seen at a single institution within 1 year. They exemplify the spectrum of symptoms that may arise from these uncommon lesions. They also emphasize the need for a high level of suspicion for aneurysm as a potential cause for otologic symptoms. Most petrous aneurysms are large and fusiform and thought to be congenital in origin (5). Other etiologies for petrous aneurysms that have been reported include radiation injury, trauma, and infection (6–8). The rarity of these lesions makes an evaluation of the etiology mandatory before formulating a treatment plan, particularly in cases potentially due to infection. In all of our cases, a definitive etiology could not be demonstrated. Symptoms associated with petrous ICA aneurysms include headache, nasal congestion, and midface pain (7). Otologic manifestations include conductive and sensorineural hearing loss and tinnitus (9, 10). Rupture as a presenting feature occurs in approximately 25% of cases with subsequent otorhagia or epistaxis (9, 11, 12). The triad of otorhagia, epistaxis, and neurologic deficit is felt to be unique to ruptured petrous aneurysm (13). The common mechanism of otologic symptoms in petrous aneurysms is erosion of the aneurysm through the posterior wall of the carotid canal to invade the middle ear or the Eustachian tube (12). The plate of bone separating the vertical component of the petrous carotid artery from the Eustachian tube is very thin and has be found to be dehiscent in 4/10 cadaveric specimens (14). This route also provides a location from which potentially fatal hemorrhage may result should rupture occur, as was the case in our patient 3. In each case, however, including case 3, otologic symptoms were the first manifestation of the lesion. Progressive sensorineural hearing loss in these cases is postulated to be as a result of cranial nerve VIII compression and dysfunction. Hwang et al suggested that the erosion of the petrous aneurysms into the cochlea directly was implicated in the sensorineural hearing loss in their case (2). Although rare, petrous aneurysms can also present with sudden sensorineural hearing loss (10). Lateral expansion of the aneurysm into the inner ear structures may produce pulsatile tinnitus, vertigo, or hyperaccusis. Presence of a retrotympanic hypervascular mass is another presentation that needs to be studied carefully by imaging before biopsy. Petrous aneurysms can be demonstrated on cross-sectional imaging. On CT, these usually appear as destructive lesions of the petrous bone oriented along the carotid canal. There is usually well-corticated expansion of the carotid canal. On MR imaging, the lesion demonstrates complex signal intensity owing to the turbulent flow within the aneurysm. There are regions of flow void and intense enhancement compatible with a vascular lesion. Differential diagnosis of such an appearance includes glomus jugulare or a high-riding jugular bulb. 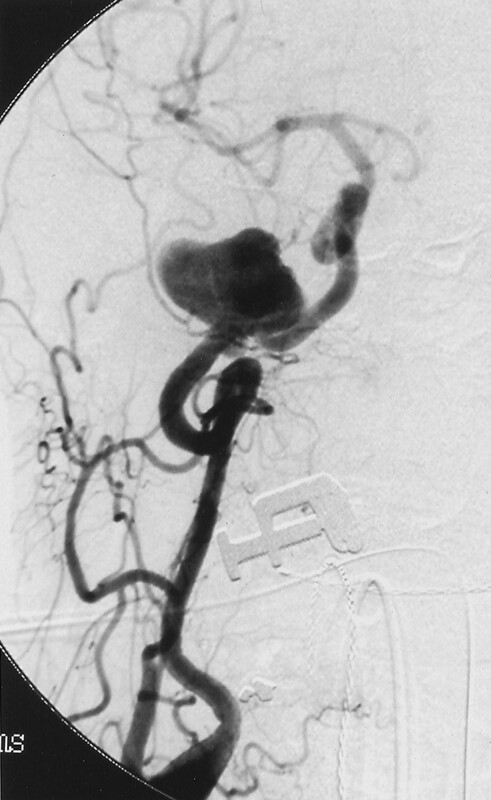 In addition, these cases illustrate the usefulness of endovascular treatments for aneurysms of the petrous portion of the ICA, which are extremely difficult to treat by using an open surgical approach. In case 2, the use of stent-assisted coil embolization permitted preservation of the carotid artery with closure of the aneurysm. In case 3, this planned approach to preserve the carotid artery was interrupted by the recurrent severe hemorrhage and need to immediately close the vessel. Furthermore, case 3 reinforces the importance of a complete angiographic evaluation, which includes visualization of the ICA, in cases of epistaxis. Accepted after revision October 28, 2004.